I hope everyone had an enjoyable Christmas. We sure did and I want to thank you all for your merry comments. It sure put a smile on my face. 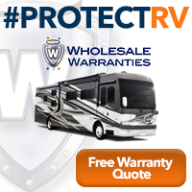 Moving on….figuratively and literally….yep, we hit the road yesterday, but before I start sharing our journey I have a couple of loose ends to wrap up about our time in the Phoenix area……. I never thought my post on Cotton would attract very much attention. Boy, was I wrong. 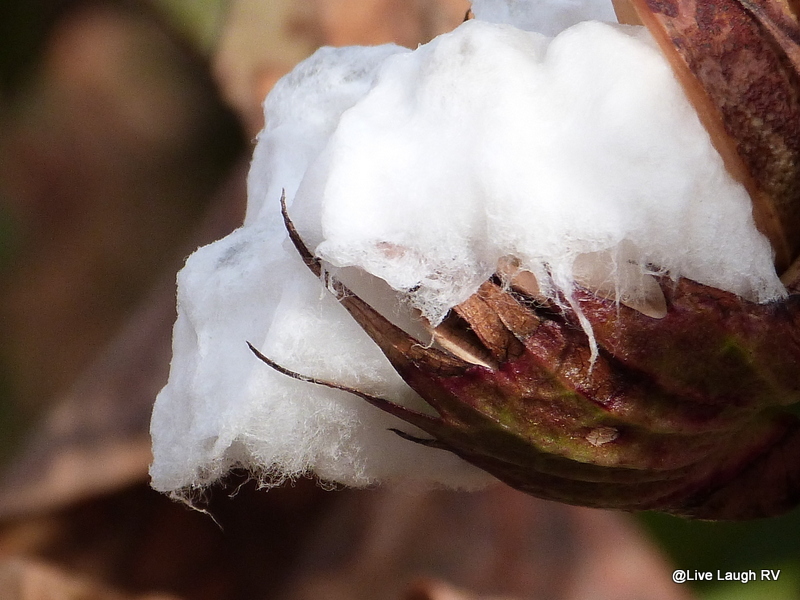 I guess I’m not the only one fascinated by this plant, fiber, textile. Thanks everyone for the awesome and enlightening comments on that post. Some of your comments piqued my interest even further regarding this intriguing plant. 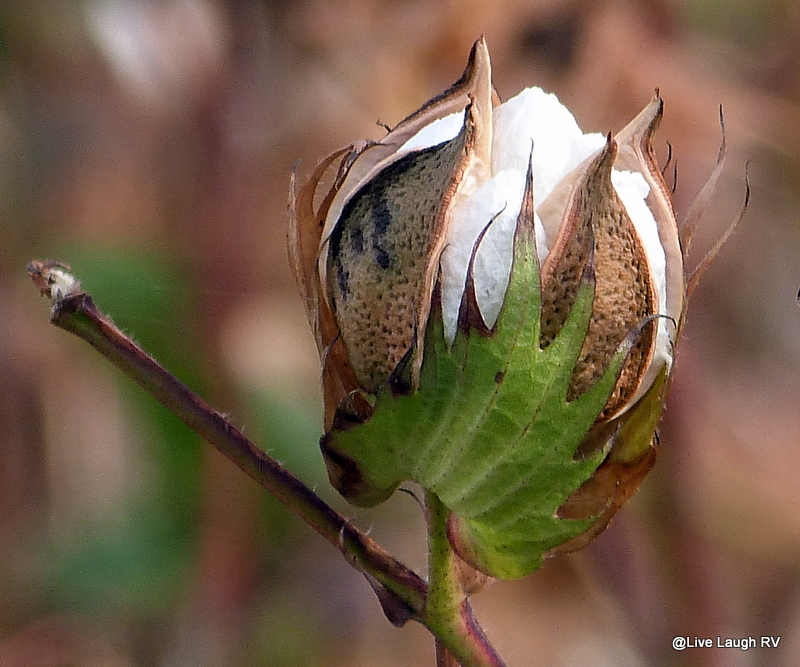 Each time I drove by the cotton fields, I would take in the transformation of the plant. As several of you mentioned, the fields would eventually turn a sea of white, and indeed they did. I then new harvest time was near. Since it was the holiday season (this harvesting took place mid December) that meant baking and when one lives in a RV it is not unusual to run out of ingredients quickly. Come on, it’s not as if I have a walk-in pantry complete with back-up supplies of flour and sugar and I won’t even begin to talk about the small RV refrigerator…..sigh. 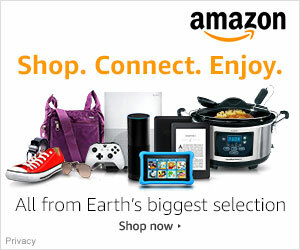 Fortunately, I had a super Wal-mart, Safeway, and Fry’s less than fifteen minutes away. Running out of supplies had me driving off to the store regularly and that meant driving by the cotton and rose fields repeatedly. Oh, darn! Can you tell how inconvenienced I was 😉 wink, wink! Talk about timing….on one of my returns from a last-minute grocery run….I glanced toward a field and there he was. Oh my gosh!!! I quickly pulled over with little care of any cars behind me, jumped out of my truck, pulled out the camera, and started snapping away. There was even an exchange of waves and perhaps an intended pose. Two dozen photos later Mr. Harvester is now at the other end of the field. What’s that I see? More equipment in the distance? I had to check it out. 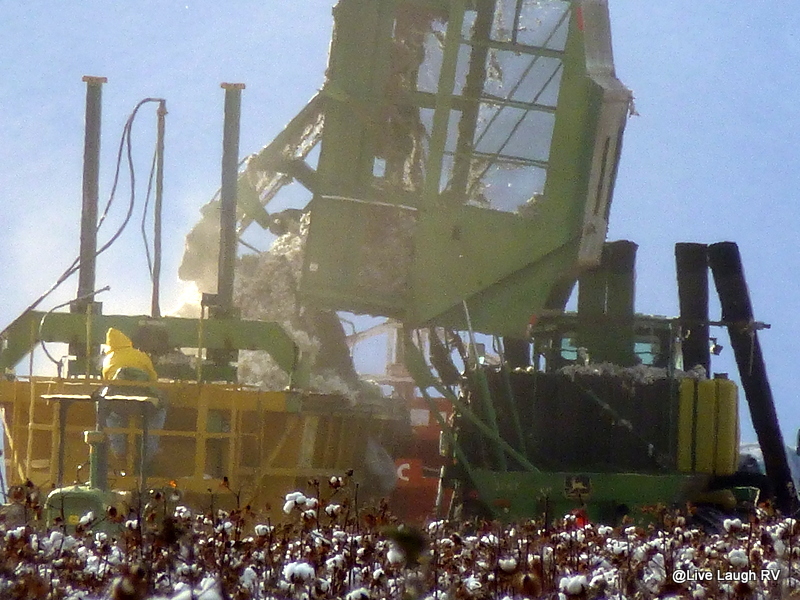 I watched as the tractor unloaded the freshly picked cotton dumping it into another container. It appears this process will then compact the cotton into large dense squares that are numbered and made ready for transport. 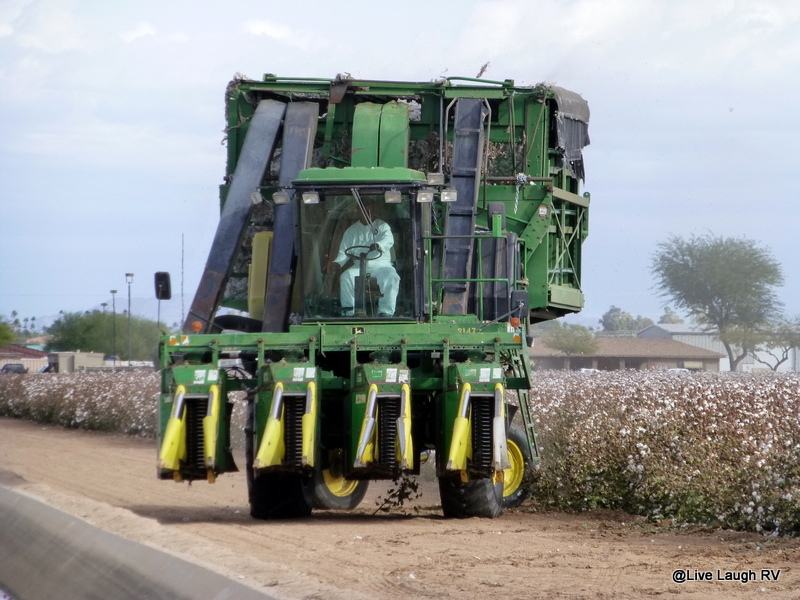 I’m not sure how many times the cotton picker goes through a field but it seems to be more than once. The harvesting continued well beyond dark with the aid of lights. This particular field was a buzz with activity for about five days before all the equipment was moved down the road to another field. Photos of me were taken by fellow blogger Jerry. A big thank you to Jerry for a fun day of running around Phoenix with our cameras. Your photographic talents and vision are inspiring! Is there anything more comfy than a soft cotton T-shirt? I live in cotton. Cotton shirts, cotton pants, cotton socks…..yep, I love my comfy cotton clothing. As a gal growing up in the Midwest, I’m used to seeing crop fields. Fields of corn, fields of beans, fields of wheat but never fields of cotton. 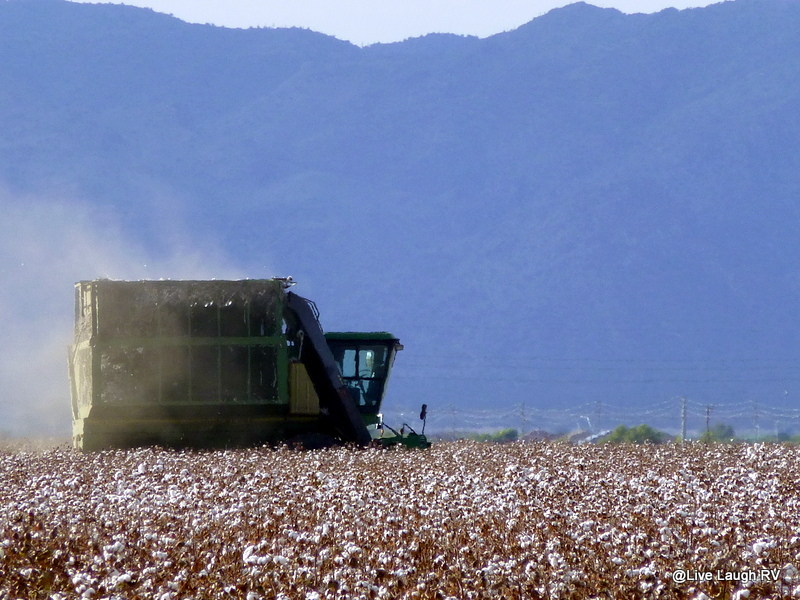 I saw my first cotton field last year. I don’t find the fields particularly attractive, nor do they seem well-organized like rows of corn or pretty like a golden field of wheat. Seeing those fields from a distance triggers a curiosity. 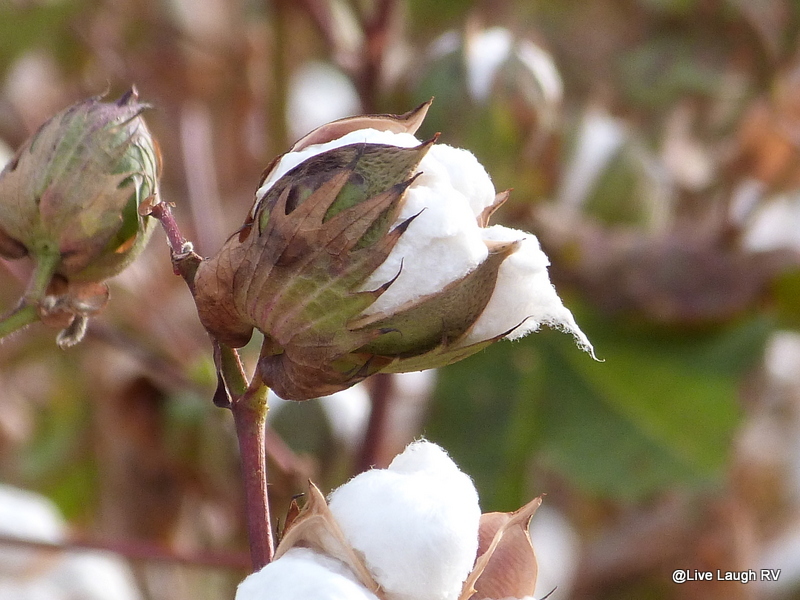 I wonder; does the raw cotton feel soft or rough? What does this plant look like up close? What does it take to turn this white fluffy stuff into a favorite shirt? 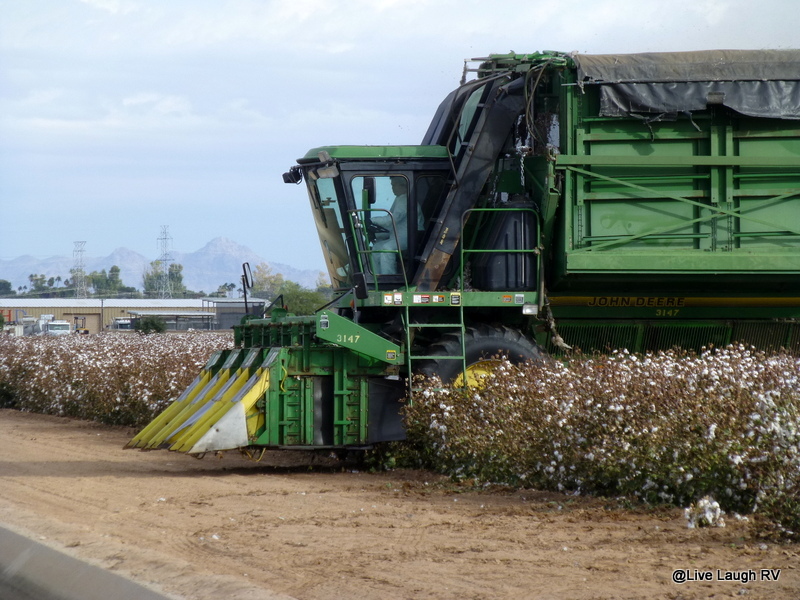 I’ve been parked on the far west side of Phoenix, Arizona for the past couple of months; just across from a cotton field. 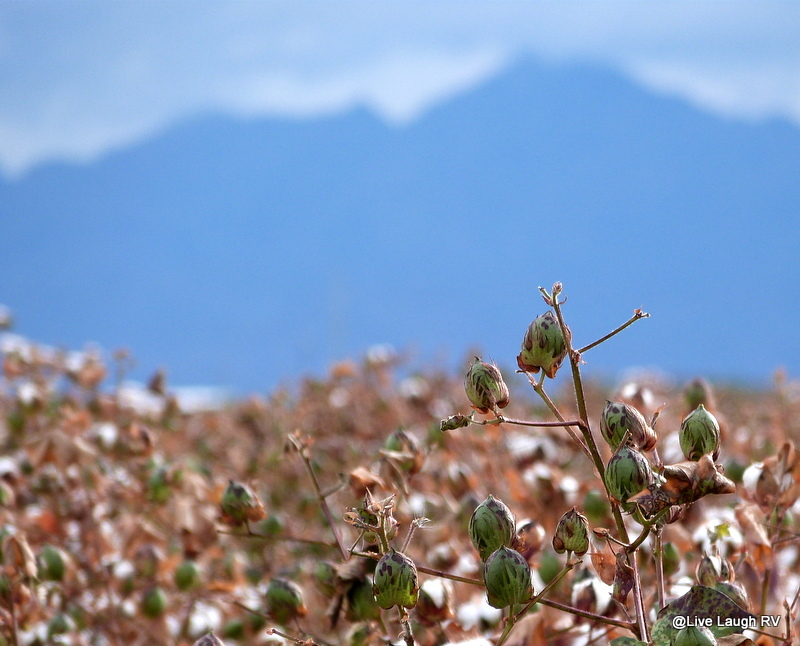 I know, who would have thought one could grow cotton in the desert? 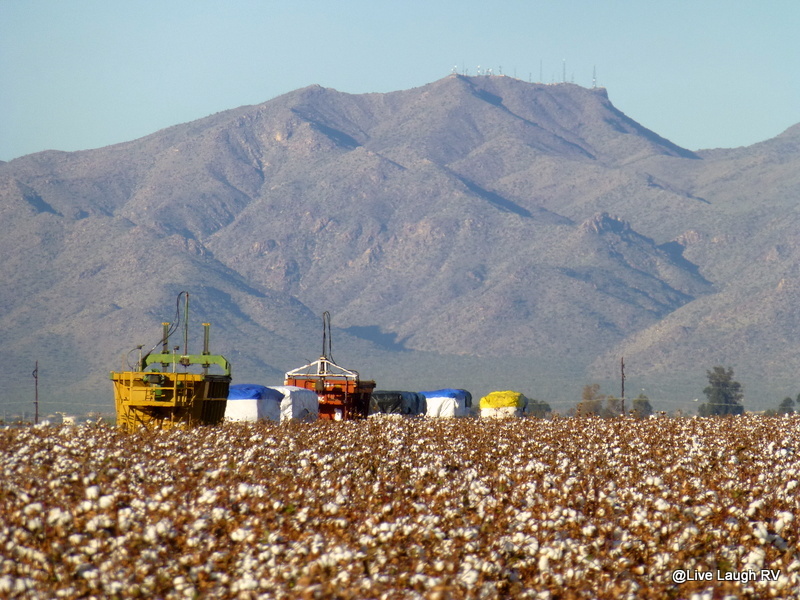 I’ve always associated cotton with southern states like Georgia, Mississippi, or Louisiana but never Arizona. It’s amazing what can grow in the desert with the help of irrigation. 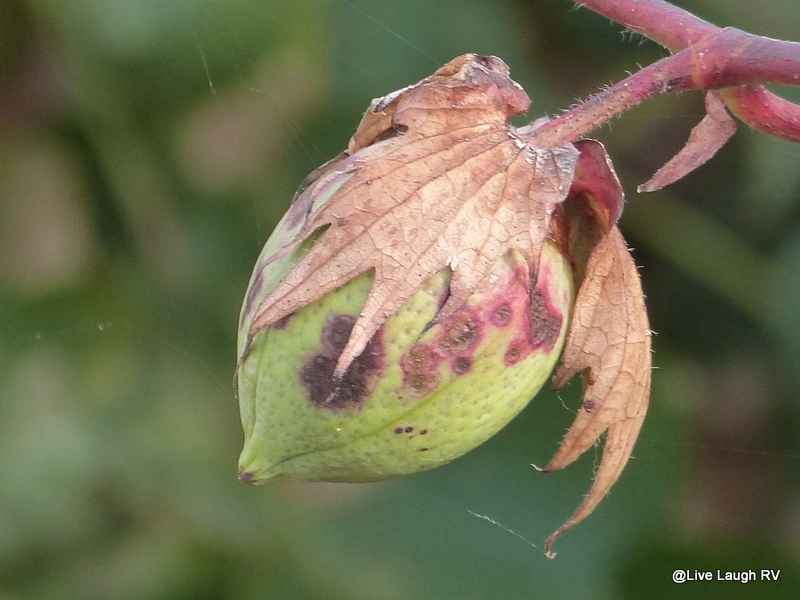 With camera in hand, I check out these plants up close. 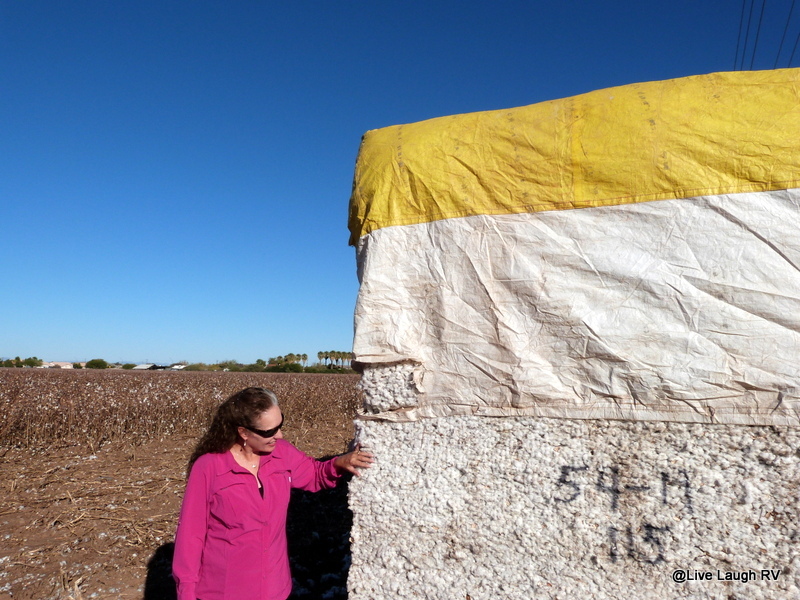 I touch the raw cotton. It’s incredibly soft. The rest of the plant seems rough and unbending. 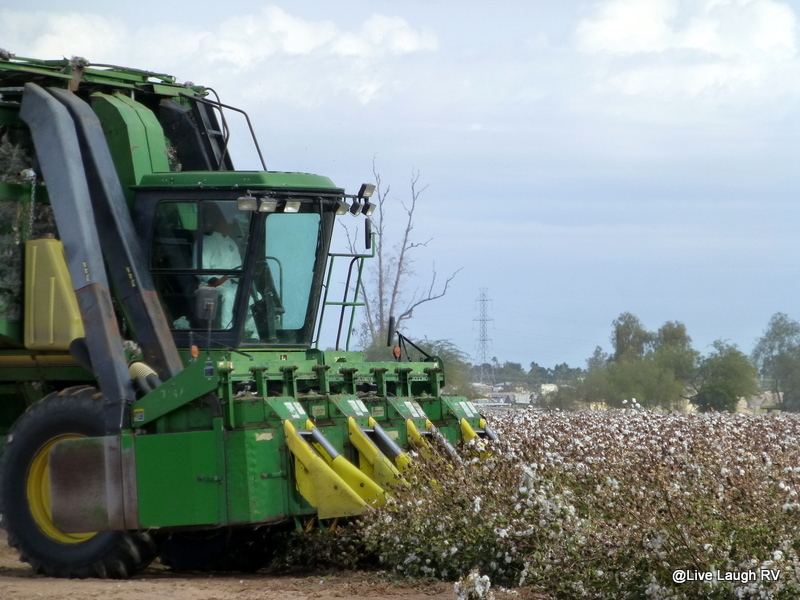 I can’t imagine hand picking the cotton. I’m clueless about modern harvesting techniques but past practices are indelibly etched in American history. 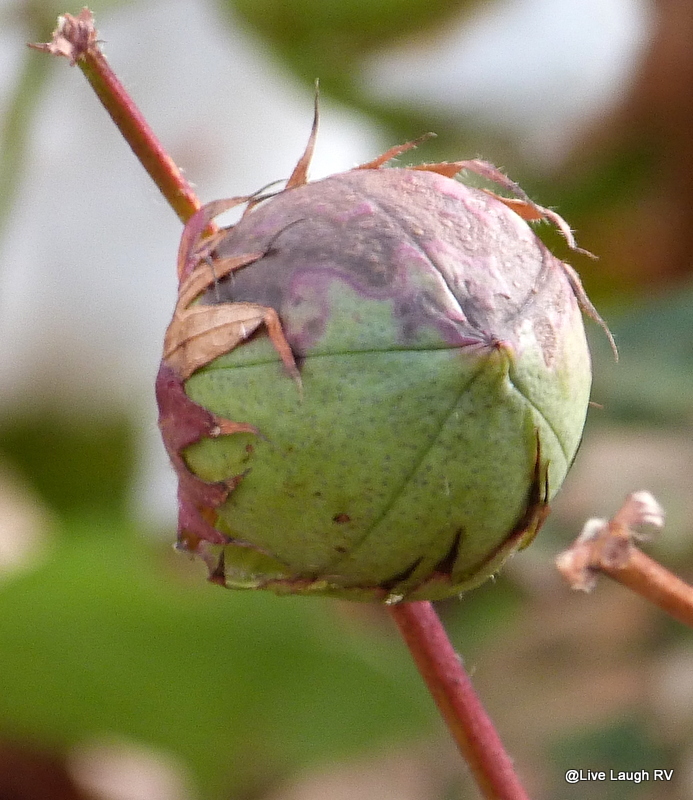 Actually cotton is a fiber rich in world history and dates back to B.C. 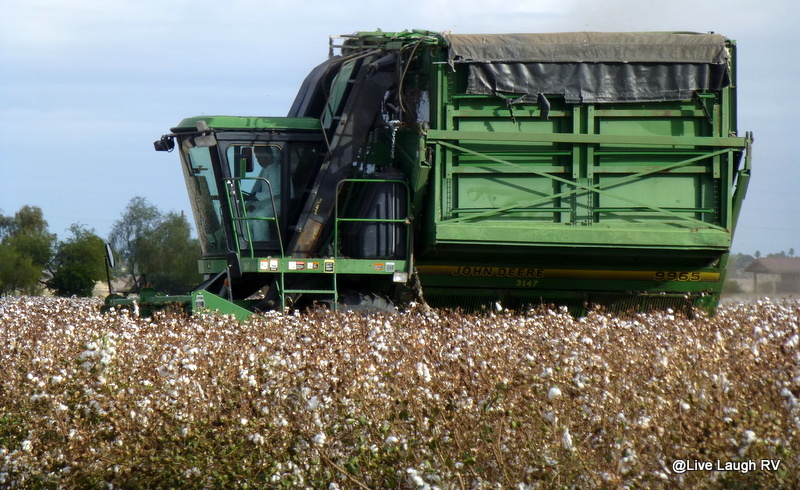 Fellow blogger, Rebecca over at Clanmother, recently wrote a post about a cotton mill in England and the industrial revolution. You can read about it here. 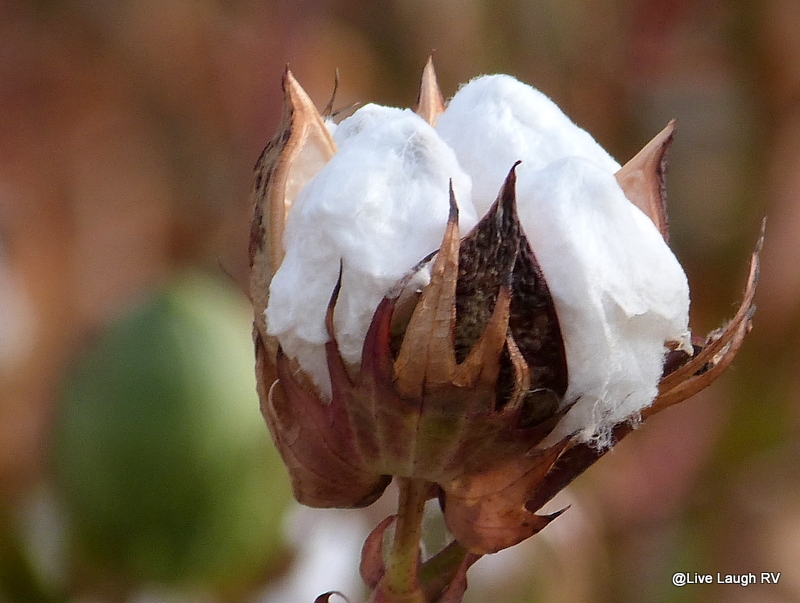 As much as I may love wearing cotton, cotton has had a tremendous impact on so many lives over the years, much of it negative. Indeed, this plant is rich in history; providing wealth to the lucky and slavery to the unlucky. Times have not changed, just the countries and the methods. Thoughts to ponder! 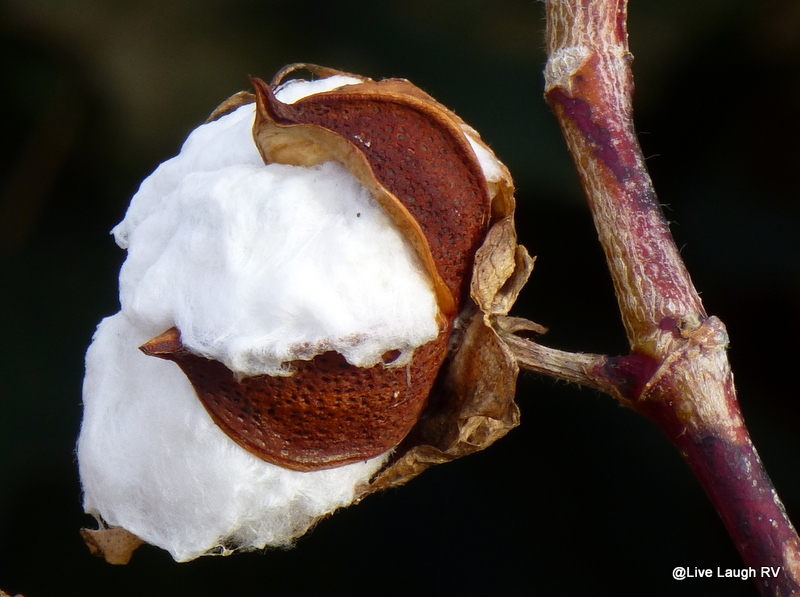 Yes, cotton is an interesting and unique shrub. As I lounge around wearing one of my comfy cotton T’s, I have a new-found respect for all the work that went into the production of my favorite cotton garment; from the plant, to the yarn, to the stitching…..I love it and will treasure it even more!